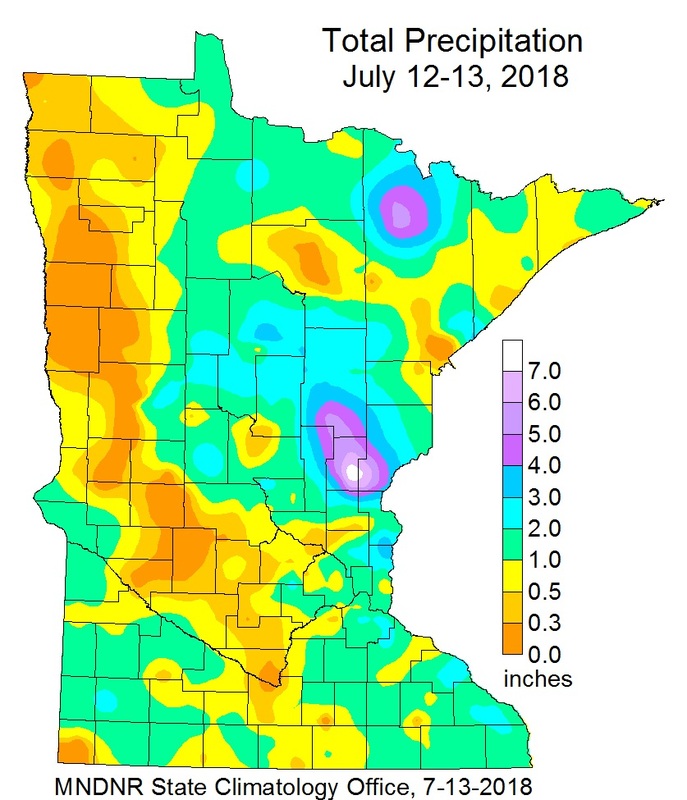 Thunderstorms bring flooding rains over parts of Minnesota on July 12-13th, 2018. A weak cold front spawned thunderstorms during the early morning hours Thursday, July 12, dumping up to seven inches of rain over Kanabec and southern Pine County, causing many roads to be flooded. One of the highest totals found so far was 7.84 inches in the town of Mora at the Kanabec Soil and Water Conservation District office. Five inches of rain fell over much of Kanabec, into Mille Lacs, southern Aitkin and southern Pine Counties. Mille Lacs Lake rose a half a foot in 24 hours. Heavy rain also fell over northern St. Louis County, with Cook seeing 4.92 inches on July 12th. Thunderstorms re-developed in the evening and dropped very heavy rains over the Twin Cities and southern Minnesota. Just over a half-inch (.51 inches) fell in 5 minutes at the Twin Cities International Airport. The total amount of rainfall was 2.17 inches through 1pm on July 13. Prior to the heavy rains, much of southern Minnesota was oppressively hot and humid. With a high of 95 degrees, the Twin Cities had a daily maximum at or above 90 degrees for the 13th time this summer. At 5pm, the Twin Cities International Airport recorded a temperature of 95 degrees and a dew point temperature of 76, creating a Heat Index of 108. This is the highest Heat Index of the summer so far at the Twin Cities. Below are Storm Reports and Public Information Statements from the National Weather Service. ONGOING WATER FLOWING OVER THE ROADS. RAILROAD TRACK WASHED OUT IN GRASSTON MN. THIS MORNING; STILL BEING ASSESSED. TO THE ROOF AND CUPOLA. BRANCHES DOWN IN TOWN AND POWERLINE DAMAGE.